The Exemplary DM Podcast: Announcing: The Exemplary Tome of Gadgets! Announcing: The Exemplary Tome of Gadgets! You've noticed we've been quiet for a while. Well this time, we have a really good excuse! 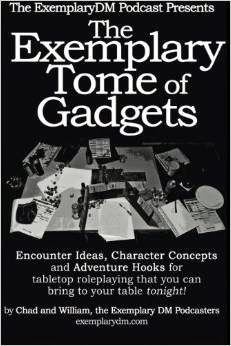 Announcing: available internationally in paperback today, the Exemplary DM Podcast Presents: The Exemplary Tome of Gadgets! UPDATE: Now Available on Kindle for just $4.00 or FREE if you buy the print edition! It is available at special price of 4.99 with Amazon coupon code HOLIDAY30 until November 30, 2014 at 11:59pm PST. This special prices the book BELOW cost! The book is currently onsale for US$6.75! The normal price of US$7.50 - just above the cost to print - means this is a perfect stocking stuffer for your favorite RPG table runner. Also a special offer - do you own/operate/frequent an exemplary local game store? We'd be happy to send - while supplies last - an introductory package of copies of the book FOR FREE. CreateSpace Direct Resellers can also purchase the book at significant discount. From the creative loins of the voices behind the Exemplary DM podcast (exemplarydm.com) comes a 50-page pocket handbook of Adventure Hooks, Encounter Ideas, and Character Concepts for tabletop role playing games that you can bring to your table, tonight! Each gadget comes with follow-up text on how this knowledge has been applied to real-life campaigns, giving you both conceptual and applied knowledge of the concept, as well as a surface large enough to act as a coaster for two (2) cold drinks! Bargain priced and indexed for quick reference, this gift is a perfect stocking stuffer for the aspiring or experienced Dungeon Master in your life. The plot twists, encounter ideas and NPC/PCs concepts inside are system-agnostic for easy adoption into any game system. gifting to a player in your campaign when you've used every gadget and watching in horror as they realize every plot twist came from a book! Published November 2014. 50 pages. While the ExemplaryDM podcast is definitely Not Safe For Kids to listen to (as we say in the intro of every episode), the book is family-friendly. Listen to the special announcement recording from author Chad and co-author William here! Right-click and Save-As below, or us the RSS feed built into this page. You'll notice our new bumper music on this podcast, used with permission from Mississippi Bones, check them out on bandcamp and iTunes. We used their song "Dungeon Hustle" on this episode, tell us what you think! Also check out the music lyrics video for Dungeon Hustle, which is what really turned us on to the band. Once again big thanks to the Diablo String Orchestra for the intro music! Welcome all our new listeners to the family of ExemplaryDM! Give us reviews in the comments below, hit us up on Twitter @ExemplaryDM where William tweets, or @Exemplary_Chad where Chad tweets, or shoot us an email at exemplary d m at gmail dot com.